Sec. McDonald clearly chose his words poorly. But he remains a dedicated leader for veterans and a reliable partner for all VSOs. 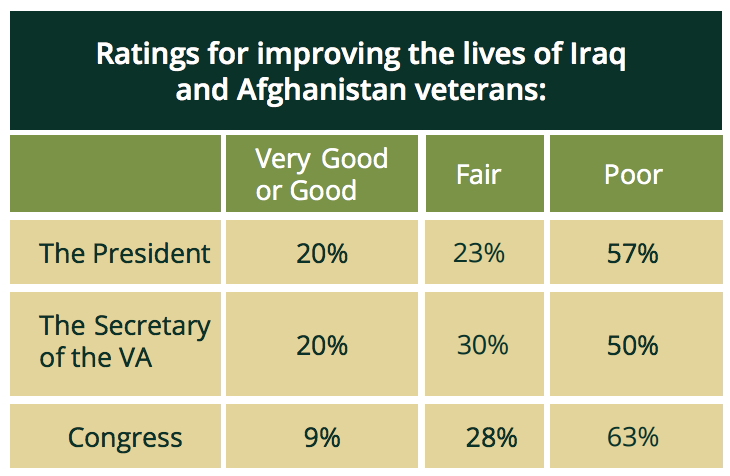 As illustrated this week in the release of IAVA’s Annual Membership Survey, the reality is that VA continues to be a very mixed bag for veterans. Any emphasis on the high quality of care by anyone must go hand-in-hand with a recognition that poor access to care has impacted too many veterans’ lives nationwide for far too long. That’s the ground truth we see at IAVA every day. 47% reported a good or very good overall experience with VA health care. 24% think the VA is doing a good job on mental health; down from 38% in 2014. 31% would refer a friend to the VA.
54% were not familiar with the VA Choice Card program. 79% reported waiting over 125 days to be notified of the VA claim decision. 56% reported waiting over 125 days to be notified of the VA appeal decision. 61% felt a financial impact while waiting on a clam. True VA reform must be a team effort. And a failure to achieve more progress after the VA scandal is the fault of both parties and all leaders–many of whom were at the helm before and during the scandal themselves. Sec McDonald can only succeed with the full support of Congress and the White House. According to our Member Survey, none of them are doing a very good job. IAVA will continue to work with the Secretary and all stakeholders to reform VA to meet the expectations of our members: an integrated system of high quality and accessible care. Rather than spending precious days playing a game of gotcha in an already shortened Congressional calendar, all our political leaders should be focused on bi-partisan solutions to help veterans. It would be extremely helpful if same Members of Congress now fanning the flame on a debate about poorly chosen words were as vocal and passionate about the attack on veterans happening right now in their own house—a $3.4B cut to the landmark Post-9/11 GI Bill. Unfortunately, on that issue, too many are still AWOL. As illustrated at www.DefendTheGIBill.org.